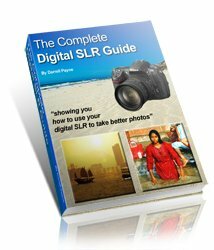 The digital photography instruction on these pages is like having your own personal photography tutor! You'll find simple help, advice, tips and tricks to get you taking better photos - tips like the rule of thirds! On this page I cover the easiest, simplest (and possibly oldest?) photography technique to improve your digital photography - the rule of thirds. The rule of thirds is a way of describing where to place focal points in a photograph. Focal points are the areas of interest in a photograph. If you are taking a portrait, the obvious area of interest is the person's eyes. If you are taking a landscape it could be a tree in the foreground. Here's the first photography tip - don't put the areas of interest in the middle of the photograph! People do. Regularly. And I can never work out why? Photographs work better when the area (or areas) of interest are placed off center. And this is where the rule of thirds comes in. If the areas of interest are best placed off center, then how far off center? It's a good question. That's where your online digital photography tutor comes to the rescue! There's an old rule of thumb to guide you on this. Imagine a grid drawn over your photograph that divides it into thirds, like a tic-tac-toe grid. Now, picture that middle square in the grid. The four corners of that square mark the locations of your areas of interest. The easiest way to demonstrate the rule of thirds is to show you. Roll your mouse over the photograph below to see the grid. NB: The photograph was taken in Vietnam (fabulous country to visit!) in the town of Hoi An. The town is a World Heritage site; and rightly so - it's beautifully preserved. 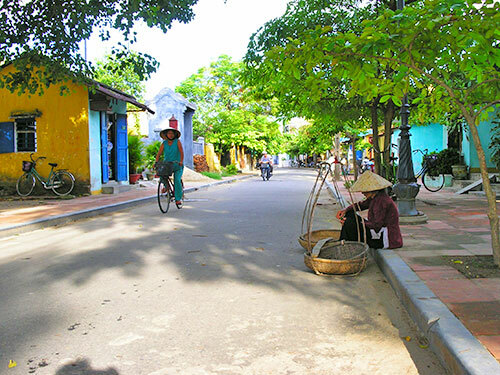 You can read more about Hoi An on the UNESCO website. With the grid on, you can see that certain elements of the picture fall at the corners of that center square (the corners you're looking for have been marked by a red dot in the photo above). The lady sitting on the kerb with her baskets - the baskets fall right on one of the corners of that center square. The lady riding her bike - she falls on the first vertical grid line. The yellow and blue house - the top horizontal grid line runs right through it. There are parts of the grid that have nothing of importance on them. This doesn't matter. Don't feel you have to have something on every line and at every red point. The important thing to take from this is to move your point of interest away from the center of your photographs and onto the "thirds". Start to do that and you'll be well on the way to mastering this simple, but powerful photographic technique! Below I've summarized the top tips that will help you use the rule of thirds, and ultimately take better photos. In landscape photography use the horizontal grid lines for things like horizons and where water meets land (lake shore, sea shore . . . ). In portrait photography use the horizontal grid lines for placing peoples' eyes, or, in group shots, peoples' heads. Use the vertical grid lines for things like trees, waterfalls, specific aspects of architecture, or just a person with a background behind them. Try to get specific focal points onto the corners of that middle square (onto the red dots in the grid above). Don't be a perfectionist! The rule is a guide. But don't feel the focal points must be on exactly the grid lines or corner points. This leads me neatly onto . . .
What? Is that a typo? Break the rule? After spending a whole page convincing you of the benefits of the rule of thirds, yes, now I want you to break them. But not every time! The rule of thirds will produce better photos in about 80% of situations. But stretch the rule a little. Imagine the grid is divided into four rather than three. And sometimes (not often!) it really is better to have the focal point in the center of the photograph. Now you have some useful tips on how to take better photos, the final tip is to get some practice! Seriously; grab your digital camera and get snapping. Because it's digital you won't be wasting any film. And you can check to see if your photography technique has improved in an instant! When you take some practice shots take some before and after shots. "Before" - where you put the focal point in the center of the photograph. "After" - place the focal point using the rule of thirds described here. Then, look at the difference! Subscribe to my monthly newsletter, "Stay Focussed". You'll get even more tips and gain access to free subscriber-only content!